Thanks to the regular relationship with several companies that have different needs, CLM has, over the years, developed and refined the necessary know-how to work in the world of die casting with high quality products. Always starting from the specific needs of the customer, CLM designs and manufactures molds for casting of single cavity, or multi-cavity for components in aluminum or magnesium. Whether for household appliances, components for the automotive or item for furniture, CLM can manufacture moulds of different sizes. 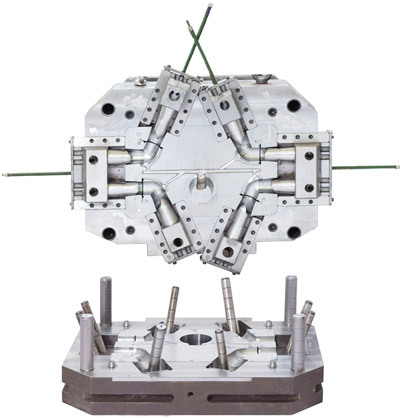 The flashes caused by the injection, the air vents channel and the connections between the different cavities in the mould can be removed with absolute precision by customized shearing moulds that CLM can also design and manufacture ; so a high quality standard is ensured. With a deep knowledge of the various stages that affect the processes of casting, CLM also designs and manufactures fully customized equipment to perform the most varied activities of processing, finishing and inspection. Whatever your request, the staff of CLM is ready to satisfy it. Contact us for more information.